The Minnesota Forecaster: Future Scan vs. Reality: How Did It Stack Up for KARE11 Sunday Night? Future Scan vs. Reality: How Did It Stack Up for KARE11 Sunday Night? In our opinion, while the future scan reasonably communicated the essence of the storm movement -- and therefore did provide a service, the future scan did not account for the heavier showers that persisted on the north side of the Twin Cities. A big deal? Probably not in this case. But we think that given the inherent unpredictability of summer storms, it can be risky business to provide an image that suggests an all-knowing future. 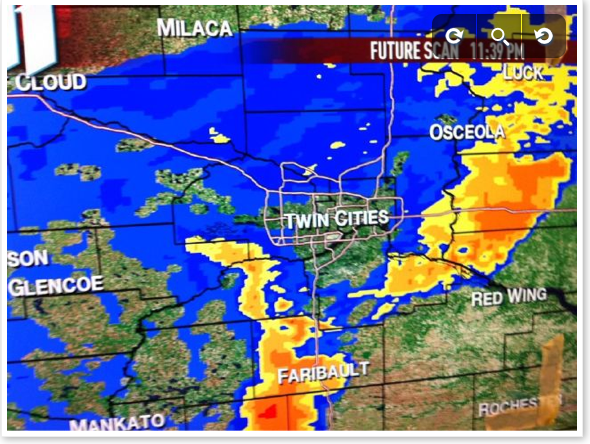 How would you assess the effectiveness of KARE11's future radar and the concept of future radar in general? Leave your comments below. 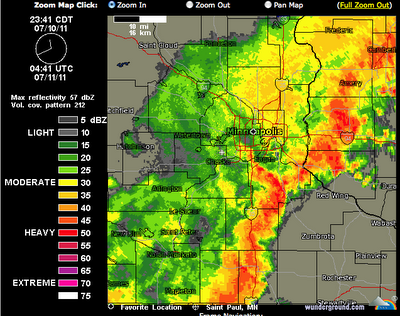 I'm still convinced that KARE 11'S radar has issues when scanning areas south and east of their site. The line of storms from the south metro on south to the MN/IA border looked much, MUCH weaker on KARE's radar when compared to all others. 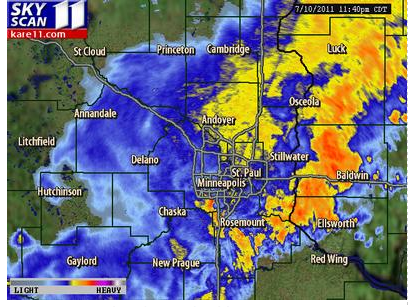 In fact, this was a solid/bowing line of storms that looked broken and weak on KARE's image. I will forward Bill a scan of the KARE 11 radar that was taken at about the same time as the image above so that you all can compare. KARE should look into this. Actually, when looking at KARE's scan above, you can kind of see what I'm talking about. Look how the radar returns are much more intense just west of Ellsworth & Baldwin, WI when compared to the returns in southern Dakota county on south to Owatonna. Many more oranges and reds in WI. The returns should be about the same since it was a solid line of storms that had uniform intensity from NE/SW. To me, this is an obvious scanning issue. Is the KARE image above of that of their radar or that from the NWS? I do know they have their own radar but also use the NWS radar when it comes to their graphic package. It may be just the graphic package that causes the difference. Maybe they are using a composite image vs a base reflectivity image. Also they might be adjusting their scan level as well. Heat wave coming looking like 5 days of 90's at least coming,get your acs in good working order,I hate the heat but I guess you need to live through it to get to fall(as mike lynch on wcco says only 64 days to snow season) can't wait! There are also business card scanners with unique features like those which are able to find shade. Some scanners might even see and read various languages, even most which have built in applications on these. There are also the ones that can browse cards irrespective of what their size will be. Furthermore, you'll find more scanners offering increased resolution than additional card scanners.Try this business card reader through which you can organized or fetched all the data from business cards.